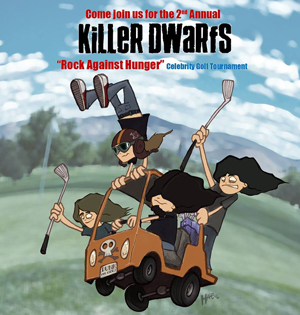 The 2nd annual KILLER DWARFS charity golf tournament "Rock Against Hunger" is happening Friday, August 26th 2016 at Lakerige Links and Whispering Ridge Golf Course 1355 Brawley Rd, Brooklin, Ontario, Canada. The event will be hosted again by none other than world renown Author and DJ Lüc Carl. Last years tournament raised over $2000 for Feed The Need in Durham. The Tournament is "Best Ball" so all levels of golfers will have a great time! Last year was a blast! We are looking for more sponsors and hole sponsors as well this year. Lets make this a day to remember and give back to those less fortunate. Contact Golf@KillerDwarfsBand.com to get your registration forms and sponsorship information.